Dr. Demento And John Cafiero On World Cafe : World Cafe What happens when a collaborator of the Misfits and the Ramones meets a guy known for mad music and crazy comedy? A new album called Dr. Demento Covered in Punk. 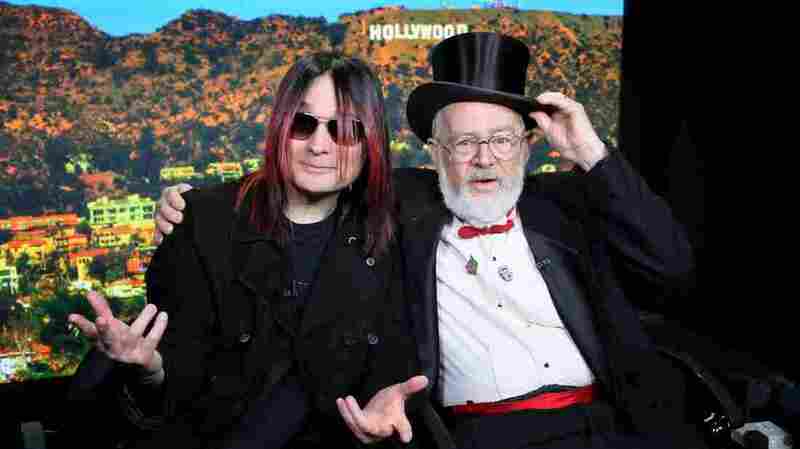 John Cafiero (left) and Dr. Demento come together on the new album Dr. Demento Covered in Punk. Napoleon XIV - "They're Coming To Take Me Away, Ha-Haaa!" Barnes & Barnes - "Fish Heads"
Dr. Demento - "Demento Segment I"
Joan Jett & The Blackhearts - "Science Fiction Double Feature"
Uncle Floyd & Oogie - "Shaving Cream"
Benny Bell - "Shaving Cream"
"Weird Al" Yankovic - "School Cafeteria"
"Weird Al" Yankovic - "Eat It"
Dr. Demento - "Demento Segment IX"
Shonen Knife - "Eat It"
Branding experts might tell you that an ideal elevator pitch should take 20 to 30 seconds. Our guest Dr. Demento requires only five words: "Mad music and crazy comedy." That's how he describes the legendary Dr. Demento Show, which gave a radio home to songs like "Fish Heads," "Dead Puppies," "Pencil Neck Geek" and "Shaving Cream" for the better part of four decades. Dr Demento left terrestrial radio around 2010, but he still hosts his weekly show online at drdemento.com — and this year, he's having a bit of a moment in the form of a new album. Dr Demento Covered in Punk features punk rock covers of kooky novelty tunes that were popular on his show, as rendered by artists such as Joan Jett, Fred Schneider of The B-52s and Weird Al, with cameos by William Shatner and the late Adam West. The idea for Dr Demento Covered in Punk came from a longtime fan named John Cafiero. Well, not just any fan: a fan with the cred to produce the whole album. Cafiero is a musician who has collaborated with the Misfits and the Ramones. His own project Osaka Popstar contributed some of the covers on Dr. Demento Covered in Punk, and he's here along with Dr. Demento to talk about how it all came together and the surprising common ground between punk music and novelty songs.